Located among towering redwood trees in the Historical Claremont District of the Berkeley hills, this 169-unit HUD subsidized building is a gem among independent senior housing in Alameda County. The original building built for the California School for the Deaf and Blind in 1922 is a historic structure housing 9 apartments, a large community room, a kitchen and the administrative offices. 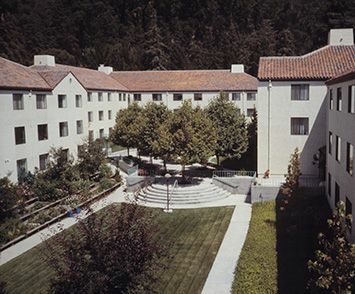 The three story high main buildings were built in 1989 and surround a courtyard filled with plane and apple trees; allowing residents to enjoy the sun or shade in one of the numerous lounge chairs found on the patios, or garden in one of the plots available to them. Redwood Gardens Apartments does not allow smoking in any common areas, and within 25 feet of the building. There are 109 one-bedroom apartments and 42 studios for citizens who are 62 years or older, 17 apartments are especially designed for persons 18 years or older with physical handicaps or mobility impairments. Apartments include an electric range, refrigerator, carpeting, drapes, and a baseboard heating unit, emergency pull cords, and fire alarms / sprinklers. There are central laundry facilities; 56 Parking spaces (assigned on a first come first serve basis) and street parking (permit for long term parking required through the city of Berkeley). Redwood Gardens is proud to be recognized as a NAHMA Communities of Quality Corporate Partner. This designation is for multifamily properties that have achieved a high standard of excellence in the way they are managed, the services they provide residents, the experience and training of personnel, and other criteria.